This page summarises the local government organisation of Co Durham since 1889. Durham County Council was formed in 1889, and in 1894 a network of boroughs, urban district and rural district councils was formed across the county. County Durham had four Municipal Boroughs in 1836, following the Municipal Corporations Act the previous year. These were Durham, Gateshead, Stockton-on-Tees and Sunderland. Later Municipal Boroughs were created for Hartlepool and South Shields in 1850, Darlington (1867), Jarrow (1875), West Hartlepool (1887). Hebburn failed in its attempt to become a borough. Gateshead, South Shields and Sunderland became County Boroughs in 1889, West Hartlepool became one in 1902, Darlington in 1915. From 1894 there were also 20 Urban Districts: Barnard Castle, Benfieldside*, Bishop Auckland, Blaydon, Brandon & Byshottles, Consett, Felling, Hebburn, Houghton-le-Spring, Leadgate*, Ryton, Seaham Harbour (Seaham from 1937), Shildon, Southwick-on-Wear, Spennymoor, Stanhope*, Stanley, Tow Law, Whickham, Willington urban districts. Urban Districts had similar powers to Municipal Boroughs but lacked the right to elect mayors or aldermen. Further urban districts were created for Tanfield* (1895), Hetton (1895), Annfield Plain* (1896), Crook (1898), Chester le Street (1909), Washington (1922), Billingham (1923), and Boldon (1936). In 1928 Southwick-on-Wear was absorbed by Sunderland County Borough. * In 1937 the districts marked * were abolished and absorbed by adjacent districts or boroughs. Crook and Willington were amalgamated as Crook & Willington UDC. From 1894 there were also 14 Rural District Councils covering the areas outside the major towns, but these had less powers. Initially most RDCs were based on the Unions, met at the Workhouse, and had the Guardians serving as councillors. These were: Auckland*, Barnard Castle, Chester le Street, Darlington, Durham, Easington, Hartlepool*, Houghton le Spring, Lanchester, Sedgefield, South Shields*, Stockton, Sunderland and Weardale Rural Districts. Those marked * were abolished and absorbed by adjacent councils as follows: South Shields in 1936, Auckland and Hartlepool in 1937, Sunderland in 1967. 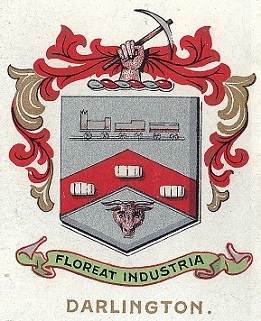 In 1967 West Hartlepool County Borough and Hartlepool Municipal Borough were merged as Hartlepool County Borough. In 1968 Stockton-on-Tees County Borough and Billingham Urban District, together with Middlesbrough County Borough, Redcar Municipal Borough, Thornaby on Tees Municipal Borough, Eston Urban District and parts of Guisborough UDC, Saltburn & Marske UDC and Stokesley RDC from Yorkshire, were amalgamated as the new Teesside County Borough. In 1974 Hartlepool County Borough was merged with Teesside County Borough and some further areas in Yorkshire to form the new Cleveland County Council, with four districts. Cleveland County Council was abolished in 1996. Its four districts - Hartlepool, Langbaurgh, Middlesbrough and Stockton-on-Tees - became unitary authorities. The name of Langbaurgh was changed to Redcar & Cleveland. Hartlepool and Stockton-on-Tees reverted to County Durham for ceremonial purposes (though part of Stockton is in Yorkshire for ceremonial purposes). In 1974 the new county of Tyne & Wear was formed, comprised of 5 Metropolitan Boroughs: Newcastle upon Tyne, North Tyneside, and (on the Durham side of the Tyne) Gateshead, South Tyneside and Sunderland. As part of this reorganisation Gateshead County Borough was amalgamated with Blaydon UDC, Felling UDC, Ryton UDC and the Birtley/Lamesley area of Chester le Street RDC to form the new Gateshead Metropolitan Borough. South Shields County Borough was amalgamated with Jarrow Municipal Borough, Boldon UDC and Hebburn UDC to form South Tyneside Metropolitan Borough. Sunderland County Borough was amalgamated with Hetton UDC, Houghton le Spring UDC and Washington UDC to form Sunderland Metropolitan Borough. In 1992 this was granted city status. Tyne & Wear County Council was abolished in 1986, though it remains a ceremonial county. Gateshead, South Tyneside and Sunderland became unitary authorities. The remainder of Durham became a two-tier government with a County Council and eight Districts: Chester-le-Street, Darlington, Derwentside, Durham, Easington, Sedgefield, Teesdale, and Wear Valley. Darlington became a unitary authority in 1997. In 2009 the remaining seven Districts were abolished and Durham County Council became a unitary authority.